A data scientist in Silicon Valley. A veterinary pathologist at the Bronx Zoo. A PhD student in history. All once worked under Eric Weeks, Samuel Candler Dobbs Professor of Physics and chair of the Department of Physics in Emory College of Arts and Sciences. Some of his other former students have gone on to become academics and physicists, but that misses the point, he says. Known for his excellence in research and teaching, Weeks consistently and generously shares his passion for scientific discovery with students and colleagues. In honor of his leadership and mentorship of graduate and undergraduate students, as well as with his faculty peers, Weeks is the 2018 recipient of the George P. Cuttino Award for Excellence in Mentoring. The award was established in 1997 by John T. Glover 68C in honor of the late George Peddy Cuttino, a member of the Emory College Department of History from 1952 to 1984. Weeks’ track record of mentorship and academic excellence led to his recent appointment as the new director of the Center for Faculty Development and Excellence and associate vice provost for academic affairs. The center supports faculty across the university in the areas of teaching, research and professional development. He will begin the new post this summer. Weeks credits his own career to a series of exceptional mentors. As a high school student, he took note of how his AP chemistry teacher mentored students: encouraging them in class and then staying in touch with everyone who had taken his class, to show his long-term interest. Since 2011, Weeks has directly mentored 100-plus students in his lab. 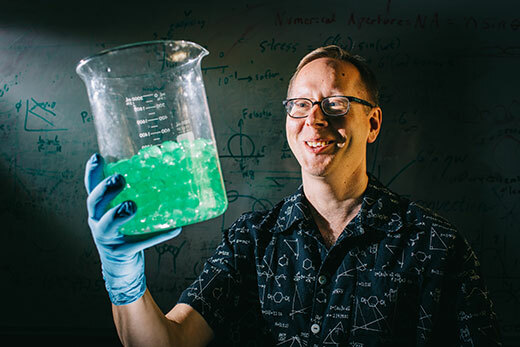 Weeks specializes in researching the physics of soft condensed matter – “squishy” substances that cannot be pinned down on the molecular level as a solid or liquid, including everyday substances such as toothpaste, peanut butter, shaving cream, plastic and glass. His research has been published extensively in leading scientific journals, reflecting work that has often involved the collaboration of undergraduate and graduate students in his lab. And he stays in touch with anyone who worked in his lab studying condensed soft materials. Some students send regular updates of their lives, which Weeks includes in a status report he sends to the whole group once a year. That’s how he knew that Charlotte Hollinger 02C, now works at the Bronx Zoo. Or that Theodore Brzinski 05C is now a colleague, working as an assistant professor of physics at Haverford College in Pennsylvania. “He is a super research mentor for undergraduates and really a mentor for all people,” says Patricia Marsteller, a professor of practice in biology and associate dean for undergraduate research and scholarship, who was among those who nominated Weeks for the Cuttino Award. That mentorship includes Weeks’ own Emory colleagues. He established the Science Education Research Journal Club, or ScERJ, as a way to draw in faculty from Emory College and beyond for discussions about the latest papers in science education and educational research. The club, which includes postdocs and graduate students, has met every week for 11 years to talk about best practices and success stories for teaching the sciences. One graduate student who attended regularly ended up using what she had learned from the club during a job interview that asked her thoughts on test design. That student, Xin Du, is now an assistant professor of physics at Aquinas College in Michigan. “It’s a mentoring experience working with him, because he brings in all these people from so many disciplines, from across all of the university, to talk about better ways of doing what we love: engage in science and teach,” Marsteller says. The efforts are linked by Weeks’ insistence that more people have better memories of science. It’s the same reason he invites first-graders to his lab every year to “play” with the malleable properties of corn starch and water (bought just for the elementary students) and sand (the microscopically disordered, macroscopically solid-like material he studies).